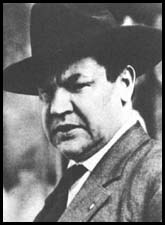 The legendary William “Big Bill” Haywood occupies a central, albeit controversial, place In the pantheon of American labor. In his time he was perhaps the most intimidating of America’s labor radicals. Haywood was a relentless organizer who mobilized workers and consistently antagonized company owners and management. John Reed, the journalist author of Ten Days That Shook the World, described Haywood’s face as “scarred like a battlefield.” A fitting description considering that Haywood was a hard-nosed, take no prisoners, lieutenant who fought on the front lines of America’s labor movement for decades. Early on, Haywood was active with the metal miners in Butte, Montana, in 1893. Then in 1896, while mining silver in Idaho he joined the Western Federation of Miners (WFM) and by 1900 he became a member of the organization’s executive board. During his membership the WFM union fought aggressively to upgrade the dangerous conditions of western mining. Using the strike as their primary weapon, Haywood and his brothers faced a government, both local and federal, that counterattacked them using court injunctions, state police, imprisonment, and hired guns. In 1902, “Big Bill” assumed a leadership role in the rapidly growing organization. Haywood was intense and inclined toward confrontation. He was a bold and forceful speaker who excelled at inspiring working class audiences. The campaign for an eight-hour work day became his passionate goal: “Eight hours of work, eight hours of play, eight hours of sleep– eight hours a day!” he liked to say. On June 27th 1905, Haywood and other prominent labor figures, including Eugene Debs, Lucy Parsons and “Mother” Mary Jones, met in Chicago. Big Bill Haywood called the meeting to order. By the time it was all said and done they had founded a new international trade union, they called it the Industrial Workers of the World (IWW) , or the Wobblies. Then suddenly on December 30, 1905, one Frank Steunenberg was killed by an explosion in his Caldwell, Idaho home. A former governor of Idaho, Steunenberg had clashed with the WFM in previous strikes. The Pinkertons were sent to arrest WFM leaders. In February 1906, they arrested Haywood in Denver, Colorado. He was then taken to Idaho for trial. While in prison, Haywood ran for governor of Idaho! His trial began on May 9, 1907, with famed Chicago defense attorney Clarence Darrow defending him. The prosecution was unable to produce sufficient evidence to convict Haywood. He was acquitted and all charges were dropped. In 1910, Big Bill went to Europe, where he participated in helping to organize strikes in Ireland and South Wales. During the trip he stopped in Copenhagen to attend a conference of socialist parties from all over the world. There he met Lenin and Rosa Luxemburg and other leading European revolutionaries of the day. In 1912, the Lawrence textile strike in Lawrence, Massachusetts made national headlines. Textile mill workers, mainly immigrants (and many women), left their jobs in protest of sinking wages. Within a week, twenty thousand workers in Lawrence had joined the IWW led strike. Authorities responded violently to the strike. The local IWW leaders were jailed on false charges, and martial law was declared. A national outrage was sparked when authorities arrested women and children who were being evacuated from the town. As a result, the mill owners lost support and were finally pressured into caving on all strike demands. The strike outcome was a huge success for Big Bill Haywood. But by 1917, Haywood’s luck began to run out; he had led important strikes in Massachusetts, New Jersey, Louisiana and Europe but Haywood and the Wobblies had frequently clashed with the government during those actions. The onset of World War I finally gave the feds the opportunity to take action against Haywood and his fellow Wobblies. Citing the newly passed Espionage Act of 1917 as justification, the Department of Justice began raiding IWW meeting halls in September 1917. Many core IWW members were arrested; they faced a wide array of charges including conspiracy to hinder the draft and encourage desertion, and intimidation. In April 1918, Haywood and 100 other IWW brothers began their trial, presided over by Judge Kenesaw Mountain Landis. The trial became America’s longest criminal trial to date (5 mo. ); Haywood testified for three full days. All 101 defendants were found guilty. Haywood was sent to Leavenworth for a year, then jumped bond in 1921 while out on appeal. By then he was in bad shape and looking at 20 years in jail. Unable to face this fate he fled the country and eventually settled in Moscow where he joined a trade union. Big Bill died seven years later in Moscow, in 1928. His ashes are buried in two places: half in the Kremlin near his friend John Reed, the other half in Chicago near a monument to the Haymarket anarchists who first inspired him. But despite this sad ending, William “Big Bill” Haywood should be honored and remembered for all of his contributions to the struggles of the working class. He stood clearly on the workers’ side for his entire life, no matter what the consequences.